Source: Thanks so much to SOURCEBOOKS Fire for providing me with an e-ARC of this book via Netgalley! Last year, I read and adored Chelsea Sedoti’s debut novel, The Hundred Lies of Lizzie Lovett. With its outstanding mystery and interesting storyline, I couldn’t get enough. Finding her sophomore novel on Netgalley made me even happier, as the storyline looked yet even more interesting than that of her previous novel. And it turned out to be that I was right! 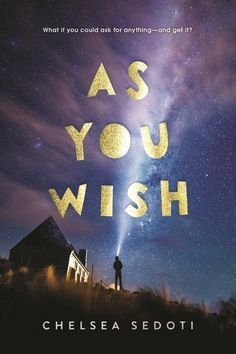 I adored pretty much every tiny thing about As You Wish. From its 3-dimensional characters to the beautiful way of words that Sedoti has, you honestly can’t go wrong with this book. To sum up the plot, it follows Eldon, who lives in a small town named Madison in which people are able to make wishes on their 18th birthday. The small catch is that these wishes cannot leave the town, and outsiders can’t know about them. Eldon is about to turn 18, but as he watches all of his friends turn of age and make their wishes, he senses something very wrong with the picture and decides to take action. I had mixed feelings about Eldon while reading. At first, he was quite judgmental and arrogant as he often gave out mean remarks and got into physical and verbal fights with others. As the story continued on and as Eldon looked more and more into the realm of the wishes, I was able to see what a selfless, brave, wise person he really was. All he wanted was to do some good for his community, and I could tell that he would have done whatever it took to get there. The intriguing premise, which is what initially pulled me into the story, was pulled off AMAZINGLY! I was always eager to read and never, ever eager to set my iPad down. The details and events were smooth, and this story always had something interesting going on. For the cherry on top, I also loved how this book ended- I won’t spoil anything, but let’s just say that something that should have happened so long ago in their world finally happened. I requested this and was declined so was kinda hoping it’d be terrible 😂 I suppose I’m going to have to buy it now. Great review. I didn’t love Lizzie Lovett, there was something about it. I do love magical realism.